David Ogilvy’s creatively-titled Ogilvy On Advertising offers a wealth of knowledge, a ton of run-on sentences, and some stories I still don’t quite understand. 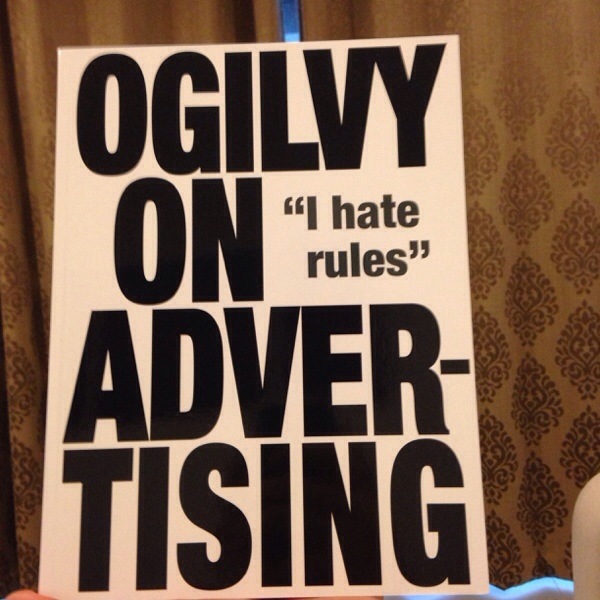 It also contains 13 predictions Ogilvy had for the future of advertising… let’s see how they’ve come along and how digital’s rise to the top has changed them. 1) The quality of research will improve, and this will generate a bigger corpus of knowledge as to what works and what doesn’t. Creative people will learn to exploit this knowledge, thereby improving their strike rate at the cash register. I’d say D.O. gets a check mark here. Big data anyone? Our digital lives are offering more information to advertisers and researchers every day. However, much of this information lives on the media side of the advertising fence and isn’t fully baked into creative development processes. 2) There will be a renaissance in print advertising. Ogilvy plays things well and doesn’t put a date or timeline on any of these – which is smart. I do think he’s right here, but the renaissance of print advertising is something that’s augmented by another medium – digital/mobile. Our phones now take us deeper into the brand experience, which the print ad is now just an entry way to. 3) Advertising will contain more information and less hot air. Up in the (hot) air, honestly. Ads are still mainly created to capture attention and then pass people along the funnel – but with digital ads and formats, users are able to get more information in one place through expandable and interactive units. 4) Billboards will be abolished. Looks outside window. Nope. Still there. In fact, outdoor is more interesting than before with augmented reality content, scannable codes, and the introduction of digital out of home. Placements that can actually infer age/gender are making their way out into the world bringing better-targeted content. Live updates and information via API feeds bring community-driven content to bus stops, tube stations, and the sides if buildings. 5) The clutter of commercials on television and radio will be brought under control. I’m going to say no here. Ads aren’t worse, but they aren’t better. 6) There will be a vast increase in the use of advertising by governments for purposes of education, particularly health education. This is definitely true. Think of all the health initiative campaigns you see today. Government agencies saw they were losing share of attention to ads and decided to get on board. 7) Advertising will play a part in bringing the population explosion under control. If you went off pure numbers, the growth rate has been slowing. However, it’s not necessarily because of advertising. Though, condom ads are a lot more prevalent than they once were. 8) Candidates for political office will stop using dishonest advertising. 9) The quality and efficiency of advertising overseas will continue to improve – at an accelerating rate. More foreign tortoises will overtake the American hare. One needs only to look at the behemoth that is WPP or Publicis (Or is it Puclicom?) to see that the U.S. isn’t the clear and dominant ad power it once was. 10) Several foreign agencies will open offices in the United States, and will prosper. It seems there are almost more foreign-owned large shops in the U.S. than homegrown shops these days. 11) Multinational manufacturers will increase their market-shares all over the non-Communist world, and will market more of their brands internationally. The advertising campaigns for these brands will emanate from the headquarters of multinational agencies, but will be adapted to respect differences in local culture. You can tell this was written in the 80s “non-Communist!” The world, though, truly is a smaller place. Digital technologies have enabled instant communication and supply chain innovations that make where a company is headquarter simply an address on a business license somewhere now. 12) Direct response advertising will cease to be a separate specialty, and will be folded into “general” agencies. This is definitely moving toward the true side of the spectrum. With a focus on direct response and performance marketing, digital found its sweet spot. As agencies grew on the back of digital’s rise, everyone wanted a piece and grabbed as much as they could. 13) Ways will be found to produce effective television commercials at a more sensible cost. User-generated content. Digital graphics. There’s no end to the efficiencies brought to the commercial business thanks to digital. Also, the fact these pieces can be spliced and diced means they can be used and re-used across all kinds of digital – pre-roll, Facebook, VOD, etc., giving added value for every creative dollar spent.